Great and unique apps are a big part of what has made the iPad such an amazing device. With that in mind, we offer up a quick review of one outstanding iPad app a week here each week. This week’s pick is Dinosaur Train A to Z, based on the PBS Kids series ‘Dinosaur Train’. I’m a little older than the 3- 6 year old target audience for this app, and on good days I’m even a tad more mature than that age group – but I have to say I LOVE this app. I almost wish we had a toddler in the house to be sharing it with. Just the stunning imagery and animation in the app is enough to make the app a joy to use. 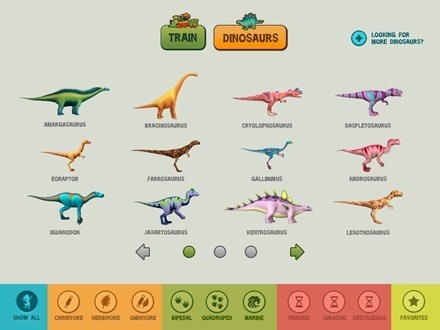 And what a great idea to use dinosaurs to help with learning / teaching the alphabet. 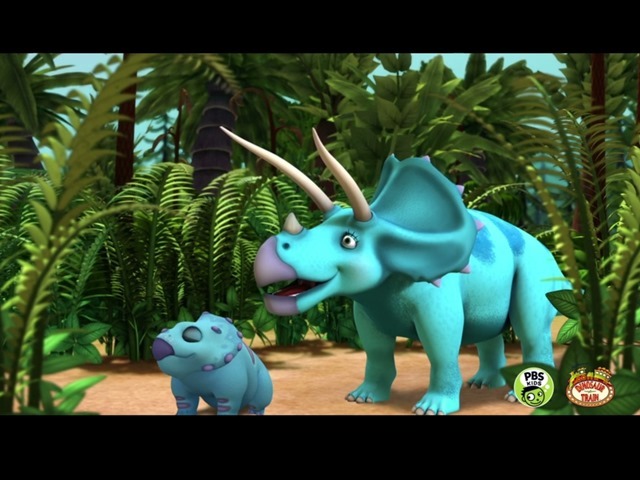 Who doesn’t love dinosaurs? The app is easy and intuitive to use. In the main ‘Train’ mode you (or your child can just tap and drag to move through the train’s cars carrying individual letters. Tap on any of the letters and you go to a gorgeous page with a dinosaur representing the chosen letter. A short description of the dinosaur is read aloud on the individual letter / dino pages. You can toggle the built-in narration if you prefer to read it yourself. 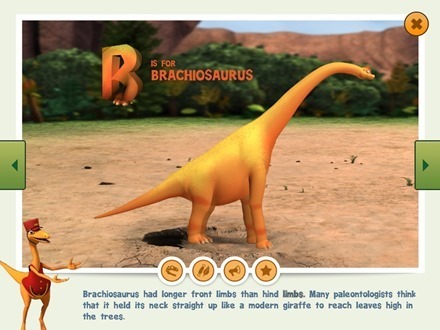 You can tap to get a couple further snippets of information on the dinosaur, and to mark it as a favorite. 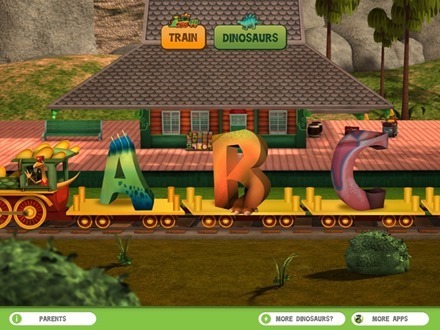 With a single tap you can move to the previous or next letter / dinosaur – or you can X out of the page and return to the train view – which is likely the more fun one for kids. There’s also a Dinosaur mode, where you can ignore the train and just get down to choosing dinosaurs to look at and learn about. The app supports the English and Spanish languages. In addition to the 26 dinosaurs included in the app, you can get additional dinosaur packs via In-App purchase within the app. They go for 99 cents each and include a Big Dinosaurs Pack featuring a T-Rex. 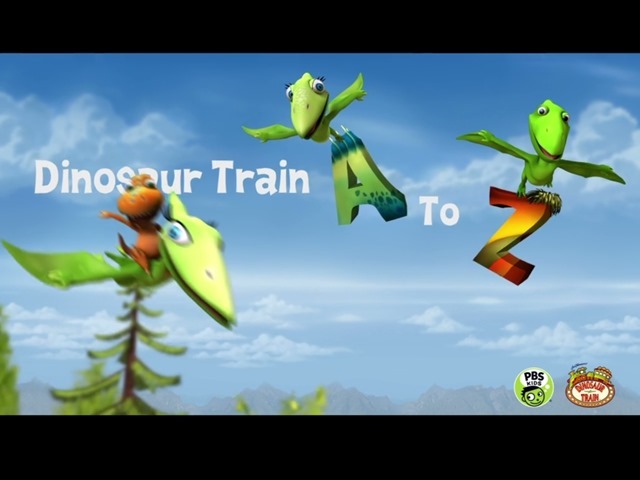 Here’s an App Store link for Dinosaur Train A to Z; it’s a universal app for iPad and iPhone, priced at $1.99. If you’re on the lookout for more great iPad apps, you may want to check out our past selections for iPad App of the Week. Unfortunately doesn’t work with 4G iPod touches, which is what my kid has. It will run the PBS Kids title screen, then crash back to iOS. If you read the reviews on iTunes, I’m not the only one. Really hope they fix this soon.